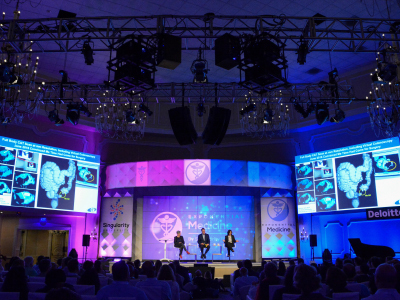 (January 10, 2018) – Singularity University hosted its annual Exponential Medicine Summit recently with WorldStage providing comprehensive audio and video support to all aspects of the four-day event at the iconic Hotel del Coronado in San Diego. WorldStage has been working with Singularity University since 2013 supporting earlier events this year focused on finance, manufacturing and the global community in New York, Boston and San Francisco. Singularity University is an interdisciplinary university whose mission is to assemble, educate and inspire leaders who strive to understand and facilitate the development of exponentially advancing technologies in order to address humanity’s grand challenges. Singularity University is based at the NASA Research Park in Silicon Valley. The Exponential Medicine Summit 2017 gathered world-class faculty, innovators and organizations from across the biomedical and technology spectrum to explore and leverage the convergence of fast moving technologies in the reinvention and future of health and medicine. It is well known as a high energy, bold redesign of a medical conference. Over the years WorldStage has been challenged by the Singularity team to push presentation technology to reflect the immersive, hands-on feel of the conference itself. The social connection and interconnectivity among all of the meeting spaces is key to the overall environment. WorldStage tapped its expertise in supporting conferences and corporate events to provide audio and video equipment to The Ballroom, breakout rooms and expo-style Innovation Lab as well as fiber runs providing interconnectivity to all those venues in the hotel and feeding the web streaming operation. WorldStage once again partnered with e2k | events x entertainment on the summit and Media Posse helped manage the content and web streaming for thousands of viewers. The unique Ballroom at the Hotel Del has a built-in stage and panoramic windows looking out to the Pacific Ocean. Playing the room in a traditional layout, WorldStage designed a rear, ultra-short throw projection solution on a 20×11.25-foot hero screen with two elevated 16×9-foot flanking screens were front projection. WorldStage also provided graphics and video playback support as well as an Encore E2 screen switching system. The Ballroom was also outfitted with a complete audio system featuring a Yamaha console, JBL and Meyer speakers and Shure wireless mics. In one of the most unusual moments of the general sessions WorldStage equipped the Beam SPS (Smart Presence System) rolling robot, used for videoconferences, with a Shure wireless mic and played back its audio through the PA system. In the breakout rooms WorldStage provided custom configured video displays and small audio packages; the Innovation Lab was outfitted with a video and audio package complete with feeds from the general sessions or other onsite activities for the room’s big screen.